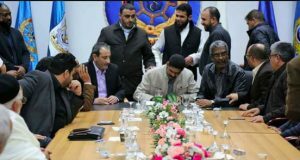 The Tripoli ceasefire brokered last night has been rejected by Haithem Tajouri’s Tripoli Revolutionaries Brigade. It said it would not halt its advance, with unconfirmed reports of small-scale fighting again breaking out. A local told the Libya Herald this was in Salahedeen district. The TRB scorned the deal saying it would never be happy with “half-measures and formal agreements” that did not represent the wishes of ordinary Libyans. In a defiant statement the TRB insisted that with no legitimate army to control the capital, it would take a stand and protect it and its people. It added that it could not allow Tripolitans to endure the conflict, chaos and corruption savaging their city. Locals faced daily sufferings through brutal murder, vicious assault and circumstances that meant they had to hide in their homes. Therefore, the TRB had to act. Tajouri’s force also accused fighters from other towns of seeking to destroy Tripoli’s stability and security. The Rada Special Deterrence Force, led by Abdul Raouf Kara has not made a formal statement. However, they are not included in the Presidency Council-backed ceasefire and are understood to hold similar levels of dissatisfaction. The Abu Sleem Central Security Force, headed by Ghneiwa (Abdul Ghani Al-Kikli) initially agreed to the ceasefire but then retracted their acceptance. They said they did not want to sacrifice their efforts and the hopes of Tripoli’s people.